This is the recipe published in the New York Times back in 2006 that got me really into baking my own bread, and it is so simple, so tasty, I really cannot praise it enough. My mum has been baking her own bread for years now (using a homemade sourdough starter that must have reached toddler age by now) and always emphasises how easy it is. Yet, however easy or tricky the recipes my mum uses are, the one thing they require which I am lacking is time – time to prepare a fresh sourdough starter and keep feeding it until ready (my last starter, offspring off my mum’s starter, died a slow death as a result of a few hectic weeks of work and lots of travel), leaving the dough to autolyse (i.e. letting the flour hydrate before kneading etc), letting the dough rise once or twice (not for a set time but usually until dough is doubled in size or the dough’s surface is dotted with bubbles – as anyone who regularly bakes bread can attest, this part of the process is not precise at all – how long the proving takes will depend on the type of flour used (even the batch of flour used – some regions, even some years, produce thirstier flours than others)), how warm it is where your dough is proving, how humid it is etc. Thus where one batch of dough might take 1h to rise, another might only take 45 minutes or up to 2 hours. In an ideal case scenario, you have time to do regular quick checks on the dough – something my current job (like most jobs which require you to work from an office) clearly does not allow. 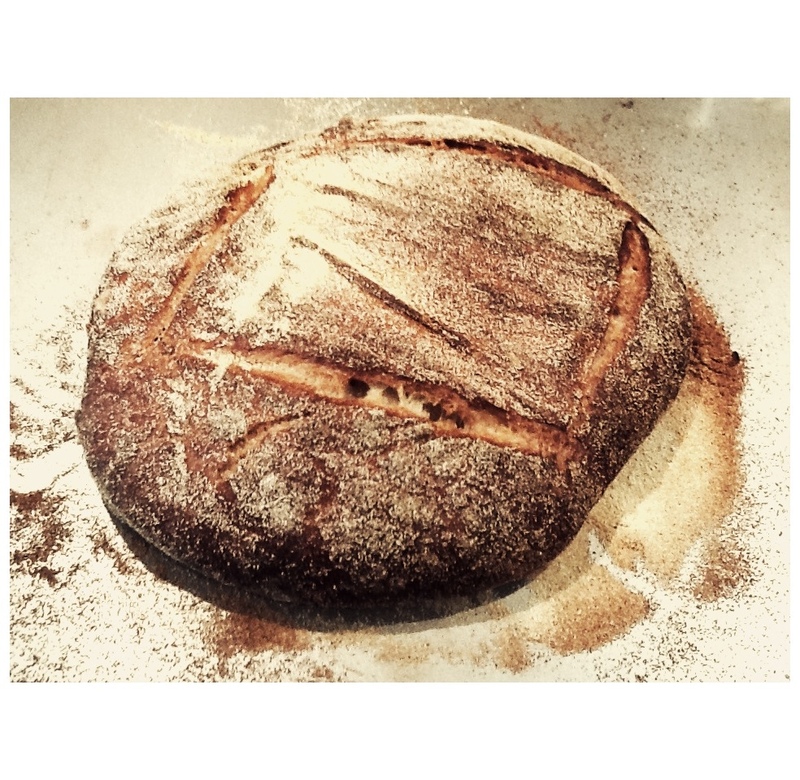 The recipe for ‘no knead’ bread was thus something of a heaven sent for me (and will be for anyone keen to bake their own bread but lacking in time and kneading skills – neither of which are required here). It takes me less than 1 minute to mix the ingredients together in the morning right when I get up. By the time I come home from work the yeast has worked its magic and the surface of the dough is dotted with bubbles all over. After shaping and some additional resting (no kneading of sticky dough here! ), the bread is ready to be baked and usually ready just in time for a quick taste of the fresh bread with a smear of butter and sprinkle of salt (who am I kidding – it is likely some of Alessandro’s Nutella I claim not to eat, funny that I have to buy a new jar every time he comes to London … ). The bread is perfect for sandwiches, bruschette, to eat with soup, or even turned into French toast, that is if it indeed lasts long enough to go stale! Besides, the bread tastes so good (achieved through the slow proving process) that I am now seriously motivated to try my hands at a homemade sourdough starter again, and that surely can only be a good thing!